Being a born and bred yinzer, I am not exempt from this neighborhood obsession. As soon as I knew I was moving back to Pittsburgh, my rental hunt started. I had two or three neighborhoods in mind that I knew I wanted to move to, one of which was Highland Park where I ended up. It’s an old streetcar suburb, two or three miles away from campus, and it’s known nowadays for being chock full of young families/professionals and beautiful old houses. In addition, there’s two very distinctive features of this neighborhood: Highland Park-the-park, and the Pittsburgh Zoo. The park– with the Negley entrance pictured above, a photo I took several months ago while out on a run– contains the water reservoir for the majority of the city as well as playgrounds, a swimming pool, and other park features. The path around the reservoir is almost a full mile long, and you’ll see all kinds of people doing laps to get exercise and some fresh air year-round. There’s also a beautiful flower garden where all kinds of exciting pop-up events happen in the nicer months. Over the hill from the reservoir is the Pittsburgh Zoo and Aquarium. This great little zoo is well-shaded by trees and home to a variety of delights, like the red panda, a walk-through kangaroo enclosure, and in the winter a weekly “Penguins on Parade” event. The aquarium is also completely within zoo grounds, so it’s really a two-for-one deal, with bonus sharks, polar bears, and otters. 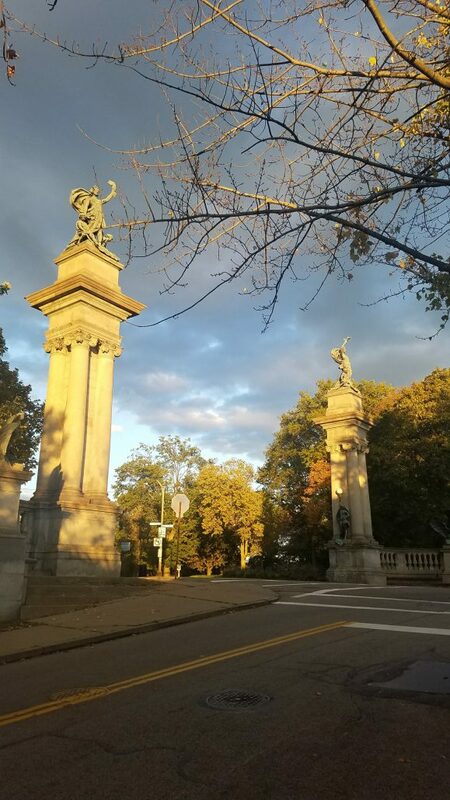 Highland Park is a little off the beaten path for the students that live in the Shadyside bubble, but it’s not without its creature comforts. Bryant St is the local business district, featuring a number of great restaurants– including one of the best Japanese restaurants in the city, Teppanyaki Kyoto, and my favorite bakery, Food Glorious Food!– and shops. It’s convenient to getting both in and out of the city and is on a lot of bus lines. It abuts East Liberty, which is where many students live and is full of even more shopping and eating options. In short– Highland Park is a peaceful oasis in the East End that still stays close to the action. 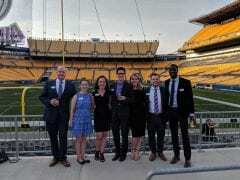 Rebecca George joined Tepper in 2017 and finally, joyfully returned to her hometown of Pittsburgh, where she can once again freely wear black-and-gold sports jerseys any day of the week and use Pittsburghese like “slippy” and “jaggerbush.” She holds a degree in materials science and engineering from Purdue University and has four years of experience in product development and innovation. Creating products for consumers, improving their lives, and seeing the resultant smile on their face unlocked a new passion for marketing in Rebecca. She has brought this love of the consumer - as well as a love of leadership and teaming - to Tepper to pivot her career and enjoy an awesome two-year journey of growth with her cohort. At Tepper, she is a proud member of the junior boards of both the Out&Allied and Marketing clubs, as well as being a Forté Fellow. This past summer, Rebecca interned at General Mills as an Associate Brand Manager on the Old El Paso brand. In her spare time, Rebecca enjoys yoga, hockey (go Pens! ), photography, creative writing, and music.